It is overwhelming to contemplate the great mercies of God that have been abundantly poured out this past year. The Lord is gathering for Himself a people from every nation, and it is such a blessing to see this unfold in the barren and needy nations of the former Soviet Union. Dear reader, may you be heartily encouraged by the fact that pastors and missionaries are being raised up throughout Siberia, Kazakhstan, and Belarus; churches have been established and are growing; new churches are being formed; and the gospel is being proclaimed to the lost! How wonderful it is to think of the various cities and villages where the good news of Jesus is bursting through the darkness. The authorities can throw preachers in prison, yet the single greatest need of mankind continues to be freely distributed! For we know that “the Word of God is not imprisoned” (II Timothy 2:9). At the same time, there remains a certain level of sobriety when we remember the many cities and villages all across Russia that have no gospel witness and the vast majority of the people who have not heard the message of salvation. Something needs to be done. The work must advance. On one hand, we can gratefully look back on this past year and marvel at the kindness of God and many answered prayers. On the other, we must turn our gaze toward the year that is before us with a sense of urgency. What will be done? The year 2012 was one of growth and new beginnings in Russia. 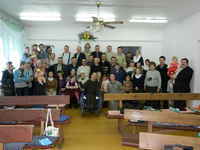 At the end of 2011, HeartCry was only supporting one missionary in Siberia and one in Belarus. Now, at the end of 2012, we are working with a total of twelve missionaries - nine in Siberia, two in Belarus, and one in Kazakhstan. The Lord, in His goodness, has answered many specific prayers, just as He promised. A few years ago, I made my first trip to Siberia to visit the only missionary that we were supporting there at that time. It was to be a trip that would aid us in answering the question: Is the Lord opening up the door for us to work in Russia? From the very outset of the trip, the Lord moved, and I was both encouraged and burdened by what I saw. The man we were already supporting proved to be worthy, and the need for more pastors and training was greater than we had imagined. By the time I arrived back in the U.S., it was clear that God was calling us to advance into Russia. Since that time, we have sought to support, train, and help pastors and missionaries - men of integrity who rightly understand and proclaim the gospel of Jesus Christ. In the past year, we have helped mobilize the church-planting efforts of five men in the Irkutsk region, enabling them to carry out full-time gospel work and the establishment of sound churches. Some of the villages where they live and evangelize are very remote and difficult to access. This gives rise to special needs. For example, HeartCry provided boat motors to aid the missionaries in the Yangel region so that they might reach areas that are only accessible by river. Through your prayers, there has been progress and fruit - though it may seem slow at times. People have come to know Christ, and villages which prior to this year had no gospel witness are being regularly visited with the good news. Bibles and sound literature are also being distributed and accepted. This past spring, I was able to return to Siberia and sit down with each of our men and discuss the work they have been called to do. I also had the opportunity to hear most of them preach and was encouraged by the way that the Lord has gifted each of them. While there, we had a conference which was composed of sessions for training as well as corporate prayer. Vladimir Radzihovski continues pastoring the church in Nizhnevartovsk, Siberia. The year 2012 proved to be a time of notable progress, particularly with the construction efforts to build a suitable meeting place for their growing church. This is a project that Vladimir undertook almost eight years ago! He worked on it by himself as he was able through what little means he could find here and there. In the beginning of last year, HeartCry began helping him and the church with support that has advanced the work significantly. They now have the entire structure in place and are working to finish the inside. One of the most significant partnerships of this past year has been HeartCry’s growing relationship with the Samara Center for Biblical Training (SCBT) in Samara, Russia. This wonderfully sound training center was established eleven years ago by a few missionary families sent out by The Master’s College and Seminary. They went at the invitation of a local church in Samara and continue working under their leadership there. What we appreciate most about this ministry is their solid doctrine and their relational approach to teaching. We began working in partnership with the seminary by supporting four of the men who have completed their courses and gone out to plant churches in Siberia and Kazakhstan. Some of these men were already pastors who were in need of theological training who are now going back to their churches. Others are young men who have been called by God to plant churches where there are none. Thus far, they have proven to be men of high caliber and genuine piety. Another encouraging aspect of SCBT is their effort to prepare indigenous workers for leadership roles in the seminary. This past year, they have been working hard to raise up Russians who are taking on the responsibilities of teaching, training, and administration. The missionaries sincerely desire for this training center to outlive them, and they are on the right track for making it happen. Paul Washer and I had planned to travel to Samara this past November for two conferences and multiple training sessions with the students and pastors. Although our trip was canceled, they went ahead with the conferences and training. Here in the office, we were able to film Brother Paul preaching a short series of sermons for them that they later translated for the conferences. They reported that there was much conviction and edification. The church in Kazakhstan has faced much opposition in the past year. As we reported earlier, the authorities passed new laws that tightened registration requirements for religious groups. This was a strategic move by the government to stop the public meeting of churches and to enable themselves to take strict legal action against those who would oppose. However, in spite of these measures, God has provided a way for the church in Petropavlovsk to legally register. The church is pastored by HeartCry missionary Bakhid K. He and the church there send their greetings and thankfulness for all the prayers on their behalf. Since Belarus is a restricted nation, advancing in this area is especially difficult. Despite this fact, HeartCry’s partnership with the church in Minsk is ever growing. I was able to visit them this past spring. While there, I met with a pastor named Alexander who was in need of support. Though it took some time to put in place, we began supporting him later in the year. In addition, the literature translation and distribution efforts of Slava V. have proven fruitful and are progressing. Paul Washer’s workbooks, The One True God and The Truth About Man have both been successfully translated and printed in Russian. Slava has also been working to translate Systematic Theology by Louis Berkhof and has currently translated almost fifty percent of the work. As we look to God in thankfulness for what He has done in the past year, we now look to Him with expectancy for what He will do in this new year. Our two main objectives are: Putting more men on the field, and providing for more training. In order for me to work more effectively as coordinator for Russia, I will be striving to better learn the language. I would greatly appreciate your prayers, not just for language learning, but for each of the areas listed below by which we hope to make significant advances this year for the kingdom of God and His glory! The way in which the gospel must go forth is through the preaching of the Word - this is how the Lord has designed it (Romans 10:14). For this to happen effectively, there must be more preachers, and those preachers must be adequately equipped. As the Lord provides, we will work to increase the number of men we support in Russia, specifically in Siberia. The way we will seek to do this is through Samara first, as they are the most established group with which we are currently working. We do not simply want to expand to have larger number, but we want the gospel to go forth into the places not currently being reached! Please pray earnestly that God might raise up a number of worthy men, filled with integrity and the Holy Spirit. In this upcoming year, we will be working on ways in which to better train those men we are already supporting, especially the men in the Irkutsk region. Since this is a new region, we will be looking to implement proven methods that were developed by HeartCry coordinator Sorin Prodan in Eastern Europe. The idea is to train men through “intentional” conferences, which bring together smaller groups of pastors and missionaries to give them intensive and personal training in the Scriptures. I am currently working to coordinate several trips which will take place in the near future. Another important focus for this year will be to further advance our translation efforts in the Russian language. This will be done mostly through the funding of various translation projects through Slava V. and his team of translators. I am working with him to prioritize a list of books that will be most helpful to pastors and preachers. Pastor Vsevolod G. baptizing a new convert in Angarsk, Siberia. The 2012 HeartCry Bible Conference in Irkutsk, Siberia. 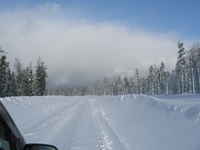 Siberia is a vast land with difficult to access cities and remote villages.